US - Well, here we go again. Or at least here goes the poultry sector again – we think, writes Steve Meyer in the National Hog Farmer. High-pathogenic avian influenza (HPAI) was diagnosed on Thursday in a flock of turkeys in Dubois County, Indiana. The positive test result was from one barn of a reportedly 10-barn contract grower complex that is affiliated with Farbest Foods. That farm was immediately de-populated and a 10 kilometer (roughly 6 mile) quarantine area was established. The HPAI strain in this break is NOT THE SAME one that created so many problems for Midwestern turkey and egg producers last summer. This strain, H7N8, has not been seen in the U.S. before. The strain responsible for last year’s losses was H5N2. Turkeys on ten more farms have tested positive but it appears that the H7N8 strain on these farms is not a high-pathogenic variety. The original one from last week was characterized as high-pathogenic. New 10 kilometer quarantine zones have been established around those farm and those zones reach into several neighboring counties. One news report stated that just under 241,000 birds were on the affected farms and that about 120,000 have already been destroyed. One story characterized the area as “poultry-rich.” In addition to turkeys, there are, according maps included in the 2012 Census of Agriculture, significant numbers of farms with broilers and layers in Daviess and Martin Counties, the two counties just north of Dubois County. Quarantine areas stretch into those counties but infected birds have been found only in Dubois County. No human cases have been reported and health officials say the virus poses no food safety risk. For perspective, Indiana ranked fourth in turkey slaughter (Minnesota, Arkansas and Virginia were the top three) in 2014 but produced more pounds of turkey than any state except Minnesota. Export customers will almost certainly move to ban imports from Indiana. One report indicates that South Korea has already done so. I expect to see more and those bans will apply to all poultry products from Indiana. The poultry industry has been worried about a return of HPAI since the last case was reported back in mid-June. The fear was that migrating wild birds would carry the virus from their summer grounds in Canada. Most of last spring and summer’s trouble was in the Mississippi Flyway. Indiana is on the eastern edge of that major pathway. The biggest concern had been for the Atlantic Flyway which passes near or over several major poultry producing areas including the DelMarVa Peninsula, North Carolina and Georgia. But that trouble hasn’t happened yet and many believe the mild fall weather may have delayed movement until recently. But it seems that is all a rather moot point given that this is a different strain of AI and that it has both low- and high-pathogenic varieties. Regardless, this could mean trouble for poultry exports should it spread to other states. That’s the bad news. The good news, though, is that it will reduce turkey supplies, pushing turkey prices upward once again. 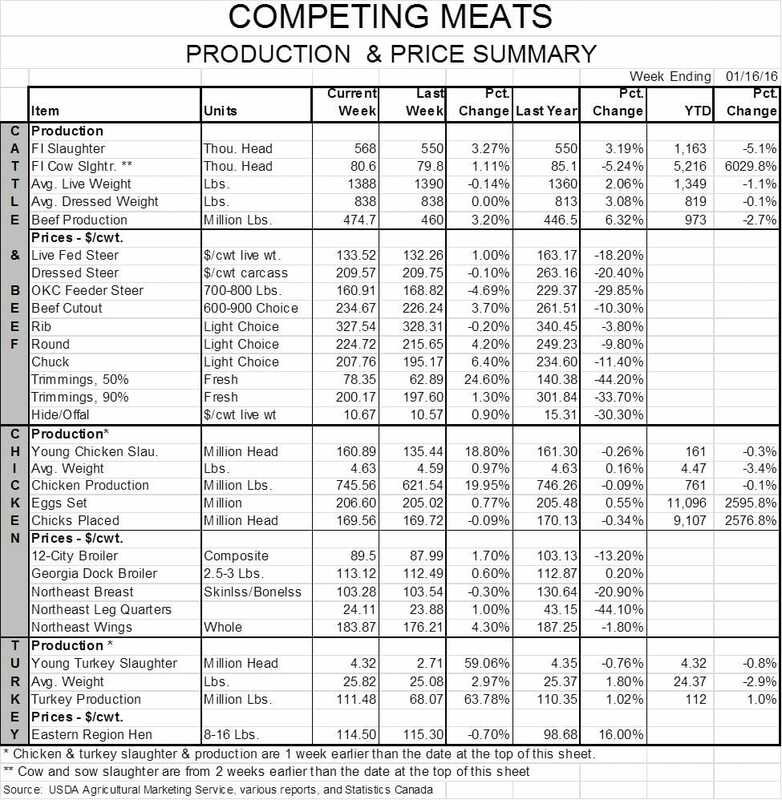 And should HPAI come to major broiler areas, I still think the impact will be positive since leg quarter (our major chicken export item) prices are about as low as they can go and any loss of birds would restrict breast meat supplies, pushing prices higher for the close competitor for pork in retail meat cases. Which raises the question of how PEDV might be impacting pig supplies in coming months? I think the answer is “Not much” based on recent data from the University of Minnesota’s Swine Health Monitoring Project. The 21 reporting production systems which represent 995 sow farms and 2.536 million sows reported only three sow farm breaks over the past 5 weeks. That after 4 and 5 sow farms broke with PEDv in the two weeks prior to that period. UM’s calculated moving average dropped back below the specified “epidemic threshold” last week after being at or above the threshold level for the prior seven weeks. PRRS, however, appears to be worse this year than in any year since the winter of 2012-2013. In fact, the highest number of PRRS breaks since July 2009 (the date the UM chart begins) was seen the week of December 9 when 14 sow farms in the UM sample reported breaks. But the four weeks since that bad week have seen only 1 to 7 reported PRRS breaks. Those figures are no worse than the past two years. 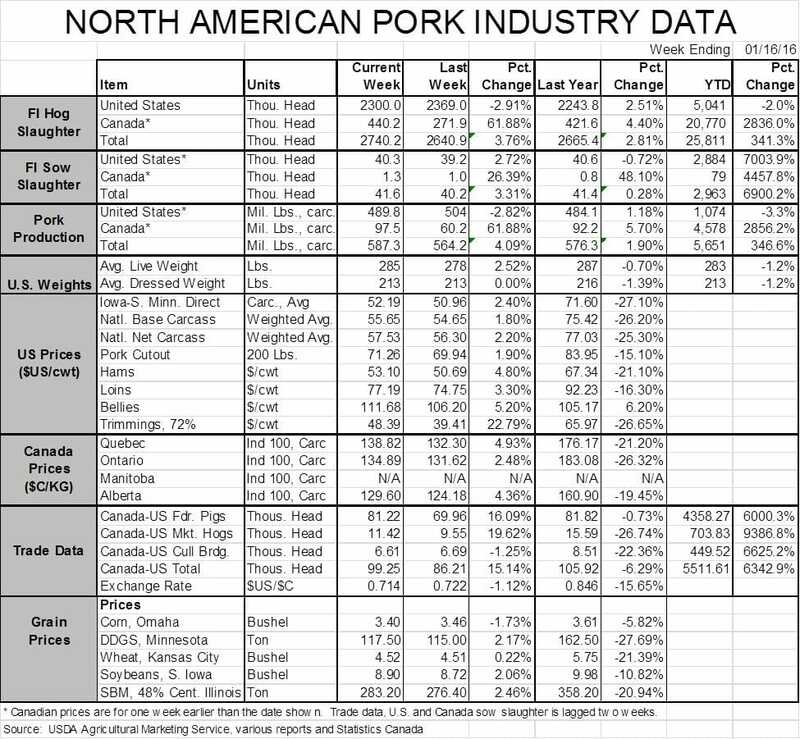 There is a lot of weekly variation in the UM observations so I don’t think we can conclude yet that PRRS has quieted down but lower break numbers are always encouraging. As is the case with PEDv, I haven’t seen enough deviation from one year ago to start making any supply adjustments – yet. Stay tuned, though. The number one rule of forecasting is to forecast often so you never know when things might change. CME Lean Hogs futures prices have rallied pretty steadily since mid-November and have now moved into the ranges I had forecast three weeks ago for every quarter of 2016. In fact, futures prices are at the top of my Q3 forecast range of $74-$78 and are about $5 higher than my Q4 forecast range of $59-$61. And recall that I was – and remain – nervous about that Q4 forecast given the potential for slaughter capacity challenges. Depending, as usual, on your balance sheet and your risk tolerance level, it may well be time to start pricing hogs for those quarters!